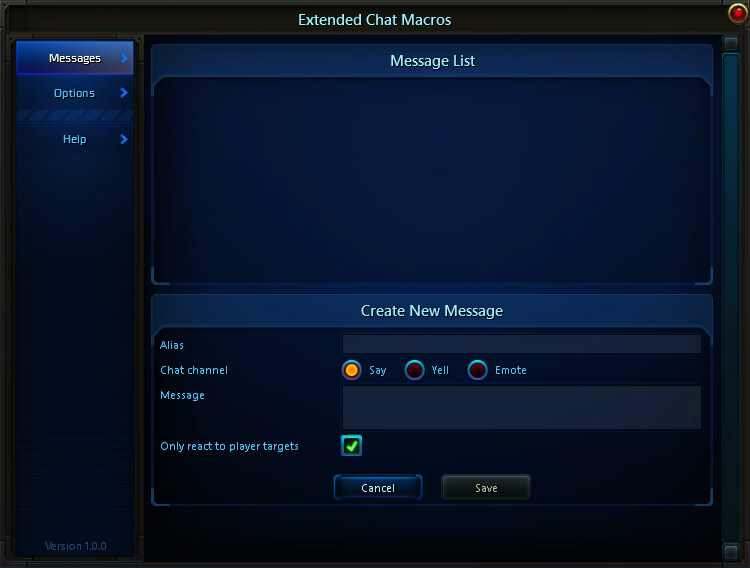 What is Extended Chat Macros? It's an add-on that allows you to create macros (actually it's "macros" within the add-on, but you can call them through macros, which is what you'll likely be doing) that can include a bunch of different variables to construct the output for say, yell or emotes. That's basically the idea behind it: Give you the ability to create emotes or sayings based on your selected target. A new message is identified by its alias, which is unique. This alias can be 40 characters long and spaces will be removed from it once you save it. Then select which chat channel this message will go to out of the 3 possible ones. Type in the message which can include any amount of the variables listed below. Set if you want this message to only react to player targets or any target (even plants!). Click the "Save" button and done! If the "Save" button isn't clickable it means that the alias or message is too long (or not filled out) or the alias matches one that already exists or one of the reserved words (reset, default, defaults). If you want to edit a message just click it in the list and the fields below will act accordingly. You can click the "Cancel" button or the message in the list again to cancel it and go back to being able to create a new message. While in edit mode you're also able to delete the particular message using the "Delete" button that will show up. Now you probably want to also use these messages and the way you do that is simply typing "/vecm alias". So for instance if you have an alias named "SayHi" you would type "/vecm sayhi" (the alias casing is ignored, so it doesn't matter how you write the alias). This can of course be put into a macro so you can have it work off an action bar. Most variables support the letter identifer in both lower- (%t) and uppercase (%T), which will output the value either as-is, meaning it won't change the case of any letters or entirely in uppercase (if using %T) - good for shouting! Most also support the letter identifier prefixed with ! (%!T (it has to be uppercase)), which means it will uppercase the first letter and the rest will retain the casing. Name (%t) also supports prefixing the letter with _ (%_t (it has to be lowercase)), which will uppercase the first letter and lowercase the rest. The pronous are all lowercase by default. All of this and more is available in the "Help" section of the add-on. You tell me. What this add-on does isn't exactly my forté as it's more for the RP crowd and such, so I don't really know what other stuff is needed. If there's something you would like added to this add-on let me know and I will look into it! Type "/ecm", "/vecm" or "/extendedchatmacros" in chat, click the appropriate button in the add-on menu list or use the menu entry in the interface menu (opened from the bottom left of your screen).